I was so excited to go to TMC17 (Twitter Math Camp). I planned the trip so that I could spend a day in Washington DC and drive the Skyline Drive in Shenandoah National Park. Both were well worth the time spent. Then on the last leg, from North Carolina to Atlanta, I got sick. As in, I can’t eat and my eyeballs hurt and I have zero energy. Somehow, I dragged myself to school, but my brain wasn’t working and, OMG, all my sessions were on the THIRD FLOOR. I’m sure I looked like a zombie, an antisocial, no appetite zombie. Anyway, I sure wished I was dead. But, somehow, TMC was still awesome. People gave me space, but they also talked to me when I was that coherent. The energy level of all those math geeks involved in learning and connecting with each other was somehow sustaining even though I was in no state to participate. When I finally started to recover on the drive home, I realized that TMC had given something to me in spite of my illness induced brain fog. And I started thinking about goals. Goal #1 More student, less me. Now that I have goals, I need to make them specific, measurable, attainable, relevant, and timely. When I was in college, the end of the semester always dragged. I couldn’t wait for it to just be over so I could start the new semester, take the new classes, and just move forward. I hated the wrapping up of the current semester: turning in the last papers, taking the last exam, and realizing I only used a quarter of the spiral notebook for a class. Before the semester actually ended, I was already thinking about the new classes. I would pour over my new schedule and happily shop for new notebooks and supplies. Apparently I still have this character flaw. I just want to be done with this year. I hate the end of year wrap up, but I do get excited about next year. I want to start planning now! Today we got our (hopefully final) master schedule, so we know what we will be teaching. Mine doesn’t have any surprises, but I do have some new classes. Next year I will be teaching Marine Pathways Algebra 1 and Marine Pathways Basic Math. The level of math is not new, but the marine focus is. The classes are also supposed to be project based as much as possible. I can’t wait to throw out the textbook (so to speak) and find ways to make the classes both marine and student centered. My other new class is 7th grade math. Although I am not excited about traveling to the elementary school (half mile) every day, I think it will be interesting to work in a different environment. Our elementary school is leaping into proficiency based and project based learning, and combined grade levels, all at once. I think the teachers will be a little stressed out as they work out the kinks in their new systems. My 7th graders will be the ones who are struggling with math, so again it will need to be hands on and project based. Since I am not as familiar with the 7th grade standards, I will have to do a lot of work this summer to get ready. I have already started to make lists of things I need to do. One of the big ideas I need to reflect on is how skills, fluency, and process need to be balanced in a math class. That one is going to take some time, research, and deep thought. I also want to reconsider classroom routines; mine could certainly use some reflection and updating. I hope to get as many summative assessments as possible done this summer which means being very clear on what students need to know. And I need to develop ideas for projects and tasks, including identifying the standards they meet and the standards that can’t be met that way. Of course, there’s always homework. This is the end of my 5th year and I still haven’t found a good way to manage homework, especially for students who struggle with getting it done. I really need to dig in to what I want homework to accomplish. Is it practice, a chance to extend learning, review, preview, or just spiraling work? I think once I pin down what I want to accomplish it will be easier to decide how. I also need to start thinking about how to interface with the elementary school. How many of their meetings should I attend? Who will be my go to person there? What supplies will I have access to? Can I get a copy of their textbook (even though I probably won’t use it)? I can really feel next year tugging me forward and the end of this year anchoring me in place. Meh. Only 13 days until I can pull the anchor and go. “Woke up, got out of bed, dragged a comb across my head… ” The Beatles. I woke up before the 5:55 alarm and debated getting up 10 minutes early. The debate ended with the alarm. My husband and I do our usual dance as we both try to get ready for the day in our small kitchen. He’s making lunch and I’m getting coffee, then he’s brushing his teeth at the sink and I’m reaching around him into the medicine cupboard. I’m taking up space to do my daily injection and he’s trying to get behind me to the frig. Finally, he’s off and I have the space to myself. I start prepping a pizza muffin recipe that turned up on my Facebook feed. Today is extended advisory after second period and I am testing a recipe on my advisory. I might also have another advisory joining us, since their teacher has to attend a senior exhibition. I think he has 9 students, so I need enough for 18 people. The recipe calls for 26 oz of dough and I only have 16 oz. How did I not notice that when I was buying the dough? Reminding myself that I teach math so I should be able to manage this, I do a rough adjustment of ingredient amounts. Finally, I have the dough in the pan and covered. I even remember to make a post-it with the temperature and time for cooking. I listen to the weather while I make my lunch. A big messy storm is coming tomorrow morning, which means I’ll have to visit my daughter tonight. I make a mental list of things to do before school starts while I pack my bags. I need to print work and attendance lists for the sub to give to students, make sure I have my charging cords, ask the art teacher about the roll of red paper she gave me, check in with another math teacher about the final for Basic Math/Pre-Algebra, talk to a student about a show we both auditioned at. I hope I haven’t forgotten anything. Two trips to the car later (because of the pizza muffins), I am finally off to school at 7:10. I am about 10 minutes later than normal and worry that I won’t have time to get everything done before homeroom starts. Instead of being 2nd or 3rd to arrive, I am about 6th. I manage to get everything into my classroom in one trip, muttering that it really is time to get a cart. I put my purse in the locking cabinet, hang my coat, and turn up the heat. The pizza muffins sit forgotten on a student desk while I start my MacBook and start sending documents to the printer. I take a few minutes to put plates, cups, tea, and dipping sauce on the long bookcase, then head for the mailroom to get my printouts. I grab them then hunt down the art teacher to ask what the big roll of red paper is for. “I thought you might make something with it,” she tells me, “because you are always folding paper.” Well, I might make something with it; I even have an idea of what I want to try. But I don’t have time to pursue that thought, yet. I go back to my room and put all the papers in order for the sub, then remember I don’t know who the sub is. Back I go to the office to ask. “Sub? You need a sub? I don’t have your form!” Gah, I know I filled out the form and put it in the inbox, but now I second guess myself. “I don’t need one for first period,” I tell the secretary. It’s ok, she can call someone. She’s really nice about the missing paperwork. But I’m still positive I turned it in. Maybe. Sub issue resolved, I go back to my room. My homeroom kids are starting to filter in. EN is there with his girlfriend, as always. RG sees the pizza muffins and asks who they are for, so I remember I need to put them in the frig in the staff room. When I get back, SB keeps trying to talk to me while I am checking my emails; I finally explain that I really can’t multi-task. The bell rings at 7:50 and the day begins officially. I remind my advisory there will be a sub, then we listen to the Pledge of Allegiance and announcements. Five minutes later, they are off to their classes. Standing in the doorway, I see the resource room teacher and we try to remember where we are meeting for the day. Then I see the teacher whose advisory may need to come to my room. He isn’t sure yet if they need to come, so I tell him to let my sub know. The resource room teacher comes back and tells me where the meeting is, so I get my laptop, cord, coffee, and a notebook and head to the meeting. The Great Schools Partnership guy (facilitator) is there, and the rest of us filter in. The life skills teacher comes in. Then the resource room teacher comes in and explains he is going to be in and out because he is working on rescheduling the basketball games to avoid tomorrow’s storm; he leaves. The principal pops in and says he will be a little late due to a discipline issue that came up; he explains what the plan is, then he leaves. The rest of us make small talk about ear worms, then I start setting up a document with one standard from each content area, the indicators for each standard, and four freshman who have different needs, but are clearly below grade level. We are meeting to talk about what proficiency based grading looks like for students in special education. The state has been quite clear in its guidance that IEP goals must be standards based, that there must be a goal for every standard where a student is working below grade level, and that standards cannot be modified. Now we are trying to figure out what that means in practice for a student who is working significantly below grade level. We blocked out the whole day, 8:00 to 1:30 for this. Finally, everyone is there and we start by reviewing the state’s guidance document. We agree to a flow chart based on the document, then start looking at the standards. Beginning with a math standard, we narrow our focus to an indicator: The student interprets, represents, and creates expressions in the context of Algebra 1. We talk about what that means at a 9th grade level and what means at a 2nd, 3rd, or 4th grade level. The discussion is not linear, but we do keep cycling back to our original question. How do we write IEP goals that are both appropriate for students and based on our graduation standards, and how does that impact the curriculum for the student. Suddenly I realize I forgot to put the muffins in the oven before extended advisory started. I excuse myself and walk fast (no running) to my classroom at the other end of the school. The closer I get, the more I can smell pizza. Someone must have put them in the oven for me! I walk in my room and there are lots of kids eating pizza muffins, hooray! I suspect RG has put them in for me and ask her. She says yes, she cooked them. I tell her several times she is awesome and I am very thankful. Then I scoot back to the meeting. Phew, she pulled that one off for me; I owe her a favor. Maybe some type of recognition on Tuesday when we hand out first semester awards. The meeting continues, then we break for lunch at 12:00. I have started taking my lunch to the cafeteria. Our ed techs rotate monitoring duty, so teachers don’t normally eat there. But at a recent event, our whole student body and staff sat down to lunch together and it was pretty awesome. Even the students thought so. So I’m going to start eating lunch in the cafeteria. I sit off by myself to give the students some teacher-free space and think about special ed. Some students talk to me as the go by and I see one student throw something across the room. With a sigh, I put my trash away, then give his name to the principal. The meeting continues after lunch. We don’t get as far as we hoped, and make plans for continuing the discussion. However, I am pretty happy with how much we did get done; it was more than I expected. When I get back to my room, it is a disaster. I find a giant tape ball, someone broke my points of congruence Christmas trees, there are papers left on the desks, and my Sierpenski Triangle printouts are missing. Meh. I hate having a sub; it’s always more work. I have suspects for the damages, but the sub didn’t leave any messages. I pick up the mess, then grab my computer and head for the staff room. It’s time for Friday PLC’s. We spent most of the beginning of the year trying to revise our leadership model. We finally came to some agreement and can start using PLC time for other things. Today we are supposed to map the rest of the year in terms of content and groupings. 16 1/2 staff members is not too large to stay as one group, but we may have smaller groups break off depending on topics. The planning gets off to a slow start, but we finally get something down for at least the next month of PLC’s. The plan includes monthly video/webinar learning experiences, monthly common scoring of assessments, and an open monthly slot for topics generated by the leadership team. Finally, it’s 3:00. I stop by my room to collect my things, then head out. I still need to stop at home, get groceries, and visit my daughter (50 miles away). After checking in at home, I head for the SuperWalmart, getting groceries for me, some cleaning supplies for my daughter, and a mystery character for my grandson. I deliver the supplies to my daughter and we chat for a while about her failed housing inspection. Finally, I head home and discover that I talked a little too long; every single Dunkin’ Donuts I come to is closed. It’s after nine when I get back from visiting my daughter and there’s a message from the director of the show I auditioned for, but it’s too late to call her back. I spend some time online checking the news, Facebook, Twitter, and Amazon. Then I’m off to bed around 10 pm. So there’s this other crazy teacher (MA) at my school and together we took a leap into the unknown this week. With little planning time, uncertain supplies, and a crazy schedule we did something unthinkable. We offered 25 students the chance to free up their Fall second period by taking a week long, intensive version of the class. We were surprised by the overwhelming response: 18 students showed up Monday morning, two weeks before regular school starts. I’ll say it again: 18 students were willing to give up a week of the last part of their summer. Whew! We were amazed. What is this class they were so willing to jump into? We called it Summer Pathways 101 to distinguish it from regular school year Pathways 101. The content of the course is all about process. We have two standards: Students will be collaborative and quality workers and Students will be self-directed and life-long learners. How hard could that be to teach, right? No math standards, no writing standards; seems like that should be a breeze! Think about a conference you may have attended that lasted three or four days all day long. Think about how intense that was and how you were both wiped out and energized at the end (if it was a good conference). Now multiply that by 17 students who are also both energized and wiped out. By the third day of five. We started the first day by jumping right into a group challenge. We split them into four groups, gave them each 2 sheets of 4×8 cardboard, 50 yards of colored duct tape, a utility knife, a meter stick, and markers. With these materials they had to build an object that would float long enough for one team member to navigate a straight course. 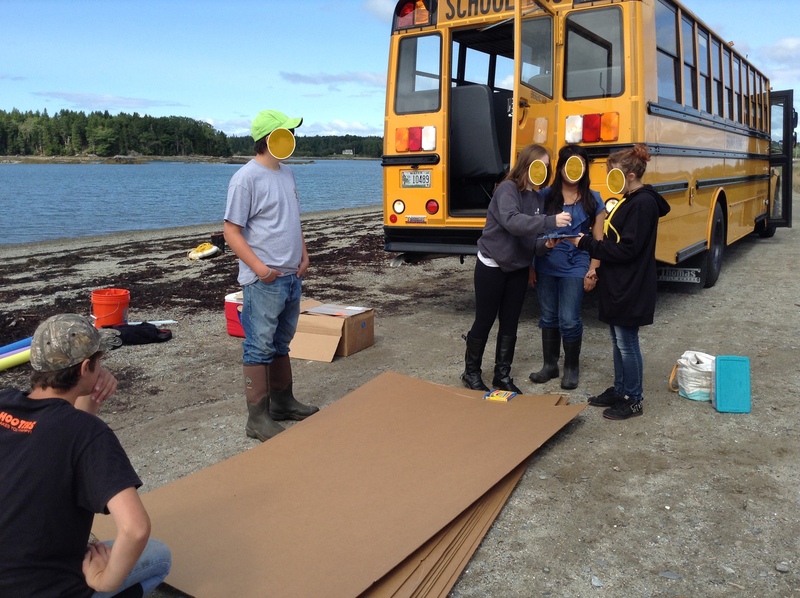 We loaded kids and materials into a bus and traveled to a local beach where they designed and built cardboard boats. Did I mention that about half of the kids were interested in the Arts Pathway and about half of them were interested in the Marine Studies Pathway? And that these two groups were pretty distinct within our school? And that about half were freshman? The real challenge for them was how to work with people they would not normally be grouped with. It was great fun to see them get frustrated and then work through it. We only had three goals and it was so hard to achieve them. We wanted students to complete a group project, an individual project, and a draft personalized learning plan. We were asking them to learn how to work in groups to solve problems, to work individually to plan and execute a project with limited resources and time constraints, and to understand this new-fangled personalized learning plan. I confess. I am addicted to twitter. And a few blogs. This morning I was reading Dan Meyer’s blog about developing questions that will engage students with problems. I would like to be able to ask better questions; as a new teacher I am only beginning to develop that skill. Although it isn’t a skill that was addressed in any of my methodology classes, I have come to believe it is a critical skill to have. Dan’s post doesn’t provide any context for posing questions. He doesn’t say whether the questions are asked in a ‘traditional’ class or an inquiry based class. Certainly students must solve problems in both types of classes and teachers must ask questions about those problems in both types of classes. What he focuses on is how question are developed. This is an important consideration for someone who wants to get better at asking questions and I appreciate the way Dan is focusing our attention on this matter. At first I was, like, yeah, that is a horrible way to focus teaching, it’s good you went off script. But then the comment started to settle. Wait. You were essentially forced to teach in a way that was abhorrent to you. And your students responded with restlessness and disruption. Somehow that resonated with an experience I had last year where I was not happy in a classroom. My students felt that and fed it back to me and soon we were in a feedback loop that created a downward spiral. It was not a great semester. So now I wonder if the commenter on Dan’s blog had spectacularly different results in student engagement because of his level of engagement. I have often heard how the passion of a teacher for their subject can infect students in a positive way; but the flip side is also important to remember. Our school has a modified block schedule, with four 70 minutes classes per day. Most classes meet every day, although there are a few that meet every other day. We run for two quarters (about 18 weeks), then all classes change and we go another two quarters. This means that summer planning tends to focus on first semester classes and second semester classes get short shrift (is that really a word?). This coming week, I will be joining a bunch of people to plan our Pathways classes. What’s that? Well, we are starting these focused course options in the hopes that we will better engage our students and our community. The classes are project based, bring in community partners, are standards based and proficiency graded. Classes are cross curricular, so that students can get two credits in core academic areas. And students are not locked in; they will have the flexibility to move into or out of a pathway. 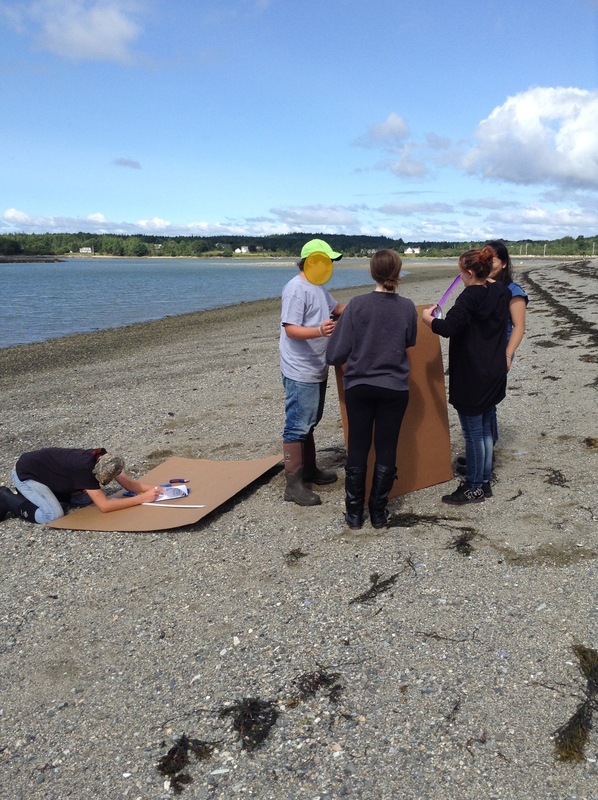 We started last year with Marine Studies Pathway to meet the needs of a community that is surrounded by ocean (yes, I live on island, but there is a bridge). Kids in Marine Studies can elect to take the Skipper’s Program and earn industry certifications. To introduce kids to the idea of a pathway, we also offered an Intro to Pathways. Now we are adding an Arts Pathway, and we hope to offer a Healthcare Pathway in 2015-16. Last year’s pilot was a little rough around the edges, since neither students nor teachers really knew how to do education this way. So this year, we are requiring all students to take Pathways 101 before they can enroll in a pathways class. Pathways 101 doesn’t have any required academic content, but it is designed to teach students how to learn in a project based class, how to collaborate, set goals, work with community members, and generally take responsibility for their own learning. This will be a fall semester course. We are also offering Marine Studies in the fall that offers language arts and biology credit and in the spring that offers physical science and math credit. The Arts Pathway will be offering History through the Arts in the Spring. Tomorrow, we start planning all the classes, including those that don’t start until the end of January. It should be an interesting week. In Fall 2014, I will have a new class, Geometry 1A. I’m a excited to have the chance to teach something besides basic math and pre-algebra. It’s a small group, only 6 kids. They’re in the 1A version because it lets them take things at a slower pace. Which means I have lots of time to do task instead of chapters. I do still have the constraint of following the text content, since they will take the second half of Geometry in a text based class. But I will have the freedom to change it up a little. I laid out a scope and sequence and then started working on the content. To help keep it straight, I have made a spreadsheet that’s color coded to my scope & sequence. Geometry 1A Content and Geometry 1A Scope & Sequence. I was just on twitter looking for a task that I heard of or read about somewhere. It has students in pairs with some type of screen between them. One student has an image they have to describe. The other student has to reproduce the image based on the description of the first student. Hedge (@approx_normal) sent me this (see 3rd page), but it isn’t quite what I wanted. However, I do like the idea of having students build 3 dimensional objects and then describing them to their partner for replication. Hmmm. I think I may have to build this task myself, but I will search a little longer, first.